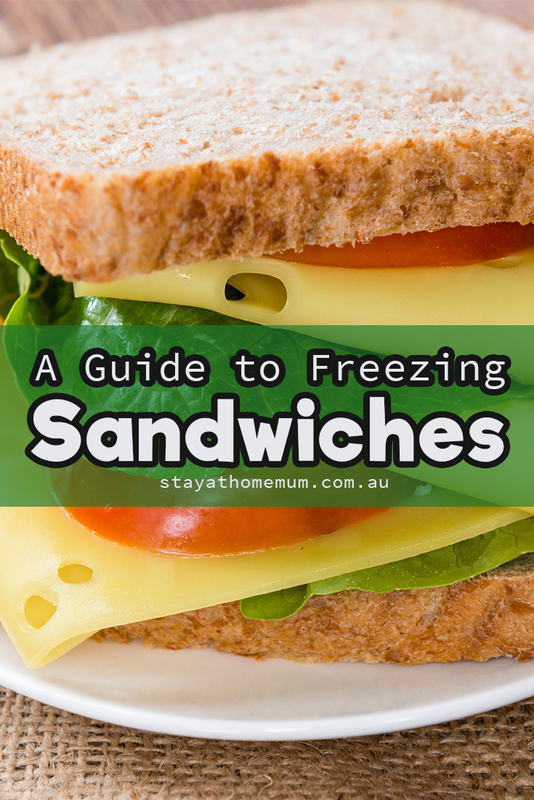 Guide to Freezing Sandwiches for School LunchesTo save you time on school lunches! Now before we begin, let me stress, FRESH IS BEST. Yep – although there are a few sandwich fillings that freeze decently, there is nothing like a freshly made lunch. In saying that, not all of us have the luxury of time in the mornings, and freezing in advance can be great way to get the lunches done quickly and efficiently. Making lunches at home is also a terrific way to save a lot of money – and provided you follow our tips, it can work well. Plus if you have time on a Saturday morning – you can freeze a month’s worth of sandwiches for the whole family! So if you have children at school, you work or you send hubby to work every day – be prepared and try it and see if it works for you! Here is a guide to what works and what doesn’t. Follow our freezing tips to make sure you get the best end result! Make sure the bread is extremely fresh if you are going to use it for freezing. Preferably bread bought that day! Ensure the sandwich is well wrapped. The best wrapping possible is plastic-wrap as it doesn’t allow air to circulate around the bread, thus making it stale. I do not recommend zip lock bags for freezing sandwiches or even air-tight containers. Place the sandwich on a flat surface in the freezer and avoid the white plastic racks if you can. Sometimes the sandwiches can ‘fall through the gaps’ and then they won’t fit in the lunch box and be a funny shape! Make sure you note on the bag the type of sandwich and the date it was made. I would not recommend freezing sandwiches more than a month in advance! If you have a sandwich press at work, perhaps consider making sandwiches to be toasted! Most breads actually freeze very well. As we mentioned above, just make sure they are fresh when freezing. Steer clear of wraps or tortilla’s if you can, these tend to get very brittle in the freezer and your more likely to end up with a mess. I think seeded bread and wholemeal or multi-grain bread tend to fare better in the freezer as they are more ‘dense’ and a lot better for you. Grated cheese – cheese slices don’t work so well – so if you want to freeze it, grate it first! Any of the above ingredients work well to be combined. For example you could have a corned beef, cheese and pickles sandwich or a chicken and mayonnaise sandwich. However condiments such as mayonnaise can make the bread soggy before freezing, so create your sandwich with the wettest ingredients on the inside! Anything that has a high water content such as cucumbers and fresh onion. Most salad ingredients don’t freeze well. Every Sunday, I spend the time after lunch ensuring that I have used up everything in the fridge and freezer – give it a quick wipe of any spills, before grabbing my grocery list and heading to the supermarket. I always shop on a Sunday – why? It is the quietest time at the Supermarket (quiet is good, helps you focus on your mission!). My husband is home so he can watch the kids. Kids make shopping a nightmare. I know not all of us have that luxury. Sunday’s always have the best deals on marked down meat and veggies. Usually after 4pm – so this is a great way to fill your freezer with cheaper than usual meat. My shopping list is sorted into the aisles – that way I can scoot around and grab exactly what I need without forgetting any items as they are already in order. As soon as I get home from shopping – the school lunches get made right away. Lightly butter all the bread, use all the toppings (I usually always make ham and cheese). Put them together neatly, wrap in plastic wrap to ensure no air can get inside – then store in the freezer somewhere where the sandwiches won’t get crushed. Any left over fruits or veggies from the last week that didn’t get used up are kept in a bowl where I do all my food preparation – these are the ingredients for the ‘School Muffins’ I then make. This week it is grated Pear Muffins and Apple and Cinnamon Muffins. They are then cooled, wrapped, dated and frozen for the week. How much money could you save a month by making sandwiches in advance?